For the past few years I’ve spent a lot of time sitting in a chair staring at a computer. When I was younger I worked in retail and stood behind a cash register or roamed a sales floor for 8 hours a day. When I worked as a full time radio news reporter, I spent my fair share of time sitting at a desk to make phone calls, write stories, and edit audio. But at least I left the office from time to time to go interview someone, cover a press conference, or head to a breaking news scene. But I’ve been a full time blogger for the past few years, and if my home office wasn’t on the third floor and my kitchen on the first, I could probably spend 10 hours or more glued to a chair. For the past year or two I’ve been waking up early to work out for 30 to 60 minutes before showering, eating, and getting to work. I’m glad I’ve built a morning workout into my routine, but it’s not necessarily enough to offset the health effects of doing practically nothing for the rest of my day. My sitting posture is also pretty awful, and I suspect I’d be in for some pretty serious back pain if I kept to business as usual. So I decided a while ago that I’d like to try a standing desk, but I was a little put off by the high cost of existing solutions. One problem is that I’m relatively short, so a desk that’s standing height for some people might not be standing height for me. I also wasn’t sure I wanted to stand all day. I started looking at adjustable desks such as the GeekDesk or JayMil Sit-to-Stand desk, but $1000 seemed like a lot of money to spend on a solution that I wasn’t sure I’d be able to use. On February 1st, I decided to just try raising my keyboard, mouse and monitor by propping various items on top of my existing desk. The first attempt didn’t work out very well, but I found a few boxes that were almost the right height, and then grabbed some spare wood from the basement and created a stand a few inches high to elevate those boxes a bit more. The end result? The setup was actually so comfortable that I wound up using it for over a month. Since the desk wasn’t easily adjustable, I basically stood for most of my work days during that time, and only sat down when using a laptop or tablet. At the end of the first day at the standing desk my legs were killing me, but I actually had more energy at the end of the work day than I’d had in ages. After a few more days, I was able to stand for 8-10 hours without my legs aching, although my feet do still get sore. I haven’t entirely decided whether it’s better to wear shoes or not to wear shoes while working at the desk. I also found myself taking lunch breaks for the first time in years. I mean real breaks where I go down to the dining room and sit down with a book to read and eat. Since there was no sitting at the computer, I learned to value this break in the middle of my day which allowed me to relax for a brief period before returning to work. Short relaxing breaks are good on the feet, legs, and the mind and I should have been taking lunch breaks before — but somehow it always seemed easier to just grab some food and then sit down at my desk and eat by the computer. 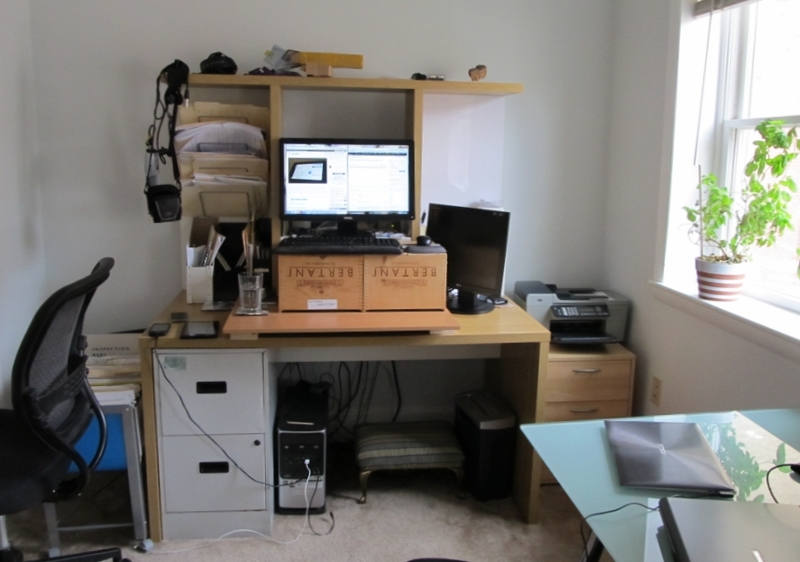 Anyway, the wine crate and spare lumber solution was never meant to be permanent, but I was still reluctant to spend $1000 on a new desk. Fortunately there’s another option. IKEA sells a series of adjustable table legs called Vika Byske that can be extended as high as 42 and 1/8th inches. They’re some of the most expensive table legs IKEA sells, but at $30 each, I was able to pick up 4 legs plus an inexpensive tabletop for less than $200. I splurged and bought a reasonably comfy bar stool for another $90 so that I can sit at the table from time to time if my feet get sore. In order to adjust the legs you need to twist them one at a time, so the IKEA desk isn’t as easy to raise or lower as one with an electric motor. 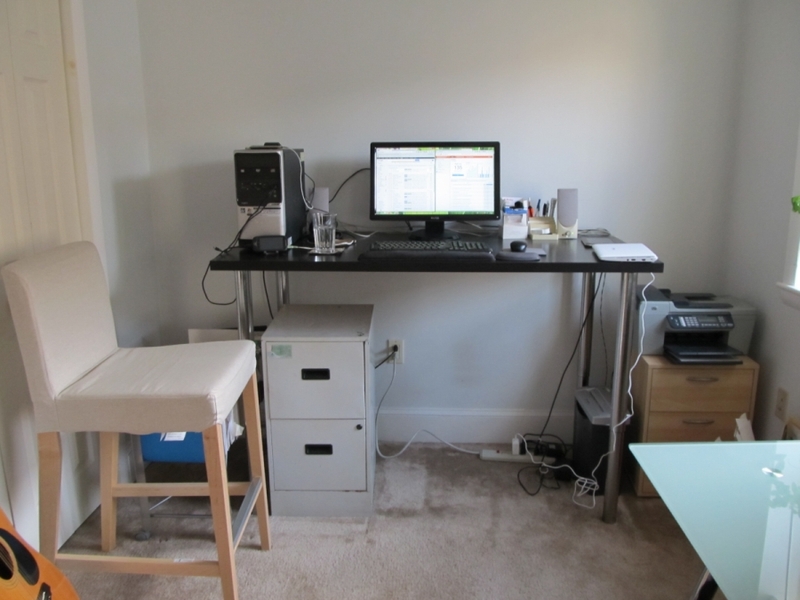 But it’s a heck of a lot cheaper, and since it is adjustable I was able to use the desk for a day or two, decide that it was a little too high, and then remove everything from the tabletop, lower the legs, and try again. Now I have a desk that’s comfortable to stand at for an extended period… and as an added bonus, it doesn’t offer the same storage options that my old IKEA desk did, so it’s a lot less cluttered. The desk was a little wobbly at first, and I can’t anchor it to the wall because it’s up against an exterior wall that I can’t drill into. But I discovered that if I placed the back of the table tightly against the wall and then lengthened the front table legs a little so that the back of the table presses firmly against the wall, the desk no longer shakes. Unfortunately that means I can’t run any wires behind the table. And since cable connecting my monitor and desktop PC isn’t long enough to run around the side of the table, I had to place the PC on the table — where I’m noticing that it’s actually pretty noisy. But I may replace the PC one day or at least get a quieter fan, while I’m hoping to use the desk for many years. A side effect of my month with the wine crate solution is that I’ve gotten used to using a single monitor instead of a dual-screen setup. I bought a 21.5 inch, 1920 x 1080 pixel monitor a while back, but I’d been using it alongside an older 1280 x 1024 pixel display — which was kind of overkill. Really I just need enough space to run two apps side-by-side or view multiple websites side-by-side. Ideally, I’d like a 2560 x 1600 monitor, but right now those are expensive enough to make motorized standing desks look cheap. But the 1920 x 1080 pixel display is really almost good enough for my needs, and it uses less energy and takes up less space than my dual display setup, so I’ve put my old 1280 x 1024 pixel monitor in the closet for now. Soon I may look for a riser that will lift my remaining monitor a few inches higher. While the desk is at the perfect height for typing, I’d like to be able to look straight ahead at the display instead of slightly down. Anyway, long story short: since I started experimenting with a standing desk I’ve had more energy, fewer back aches, and I suspect I’m building muscle in my legs. I’ve learned to value the time I do take to sit down and relax, but to treat it as the exception rather than the rule. Thanks for the extended(ish) narrative on this. Informative and helpful to see the process. I quite like the Dell U2412 monitor–it's 24", 1920×1200, and expensive. I see them at $300 fairly regularly, but recently scored a couple at work for $225 each through the magic of Dell coupons and deal sites. I like drone music and noise, but computer fans (and refrigerators and vacuum cleaners) really bug me. I'd definitely get the machine off the desk (or opt for something like a Mac Mini (but that's more money still)). How about drilling a hole in the back with a grommet insert or even just notching out the back of the desk?